Several researchers have addressed the issue of accommodating students with disabilities in college science classrooms (Brazier, Parry, & Fischbach, 2000; Womble & Walker, 2001). However, little research has focused on the types of accommodations and supports needed for students with disabilities at the college level (Stodden, 2000). 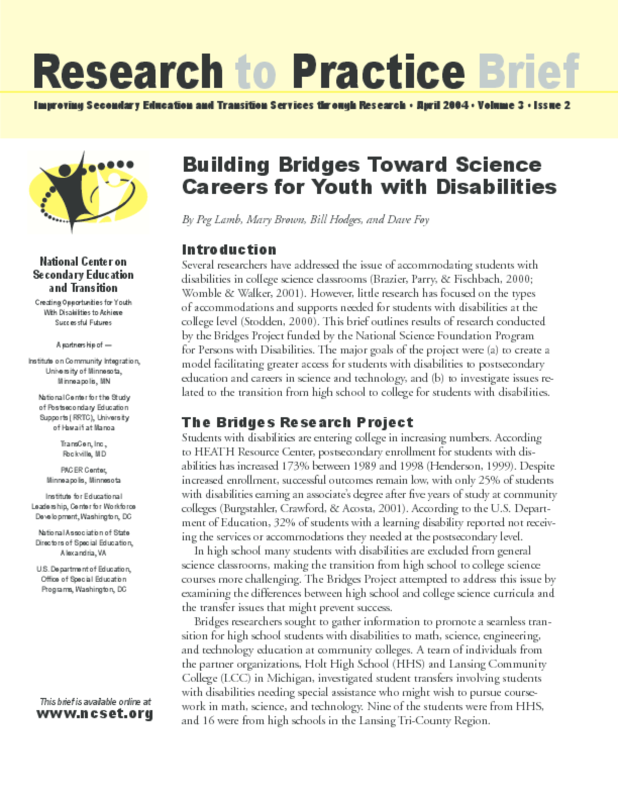 This brief outlines results of research conducted by the Bridges Project funded by the National Science Foundation Program for Persons with Disabilities. The major goals of the project were (a) to create a model facilitating greater access for students with disabilities to postsecondary education and careers in science and technology, and (b) to investigate issues related to the transition from high school to college for students with disabilities.